What the Heck is Happening to Junk Bonds? Honeymoon already over? Bad breath of reality next? If you bought the crappiest bonds on February 10, you’ve made a killing unless the company defaulted, in which case you got killed, and a lot of companies defaulted. But so much money poured into junk bonds that prices soared and yields plunged even for the riskiest near-default issues. Retail investors have difficulties buying junk bonds. Retail brokers usually sell only investment grade bonds. And that may be a good thing because each bond issue is a treacherous contract full of pitfalls and landmines that even specialists fall into or step on and often end up buying what they didn’t think they were buying. That can cause some painful surprises when the bonds default, which is a significant probability with low-rated junk bonds. So retail investors have to make do with junk-bond mutual funds and ETFs. They give their money to institutional investors who then buy the actual bonds. 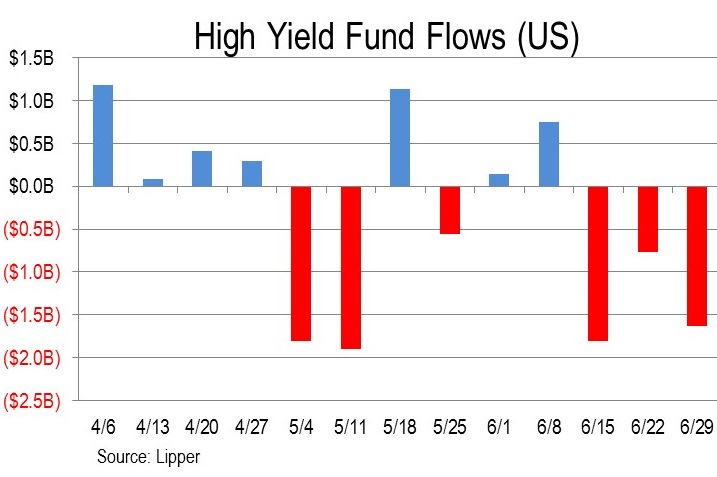 Those funds have done well too over the period: for example, the high-yield bond ETF HYG has risen 12.6%, though it remains 11% off its recent high in June 2014. But over the last three weeks bond-fund investors have soured on this gamble and have yanked their money out. Whatever that might say about fast money, hedging strategies, and other market-timing efforts, this week’s fresh net outflow drags the trailing four-week average deeper into the red, at negative $862 million per week, from negative $419 million last week and from negative $368 million two weeks ago. The current observation is the most deeply negative reading in 21 weeks. That last time 21 weeks ago was in February when investors were running scared. After the massive inflows since February, the outflows of the past three weeks brought total year-to-date inflows down to $3.2 billion. A similar pattern has played out in leveraged loans. These junk-rated loans are too risky for banks to keep on their books. So they sell them to institutional investors, including loan funds, or they slice and dice and repackage them into highly-rated Collateralized Loan Obligations to be sold to institutional investors. But loan funds have seen their heyday. The Fed has been warning about the risks of leveraged loans for over two years, not because it gives a hoot about retail investors, but because it doesn’t want banks to get stuck with these loans during the next Financial Crisis, which is what happened during the last Financial Crisis, and it contributed to the banking fiasco at the time. After the Financial Crisis, loan fund net asset values began to balloon again, doubling from November 2012 to March 2014 on a parabolic curve to hit $178 billion – which is when the Fed started exhorting banks about them. These loans trade like securities, but the SEC considers them loans and doesn’t regulate them. No one regulates them. And the Fed got nervous about the banks. Retail investors picked up the vibes and started bailing out of these funds. 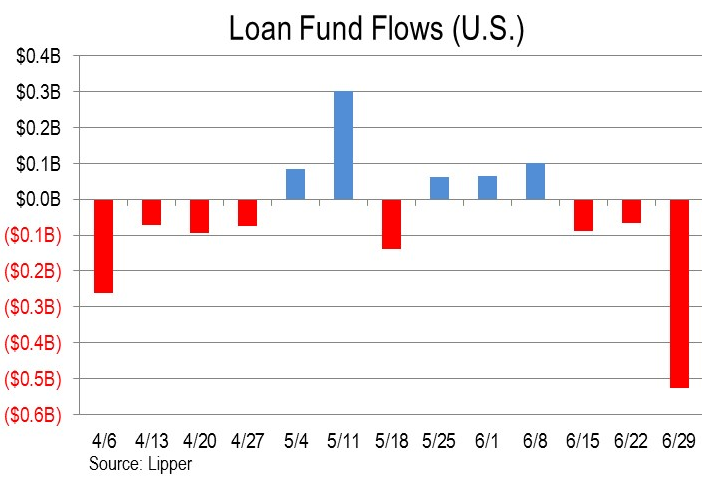 So year-to-date, net outflows from loan funds have reached $5.6 billion, knocking the net asset value of loan funds down to $60.9 billion. In a little over two years, loan funds have collapsed by 66%! Yet banks aren’t about to walk away from this lucrative business. More of them end up in CLOs. Hedge funds and other institutional investors are loading up on them. And they get repackaged into yen-denominated highly rated bonds for yield-desperate Japanese investors that the Bank of Japan has whipped into buying just about anything…. 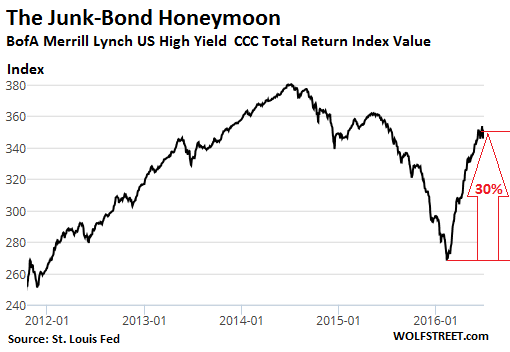 But that investors are once again yanking their money out of junk-bond funds is a sign that the high-yield honeymoon since February may have run its course, and that the bad breath of reality might once again muck up the scenario. I see in the last day or so Puerto Rico has defaulted on its ‘constitutionally guaranteed’ bonds- money it was suppose to pay before anything local, including police. And its pension fund is 99% underfunded. Apparently, the reaction is not one of surprise- it is almost common knowledge that the island would default. And no one can be surprised that the last few dollars are hoarded for basics. But were retail investors peddled these ‘sovereign bonds’ even though the most basic audit would have found a glaring inability to pay? I don’t know about Puerto Rican bonds, but I can tell you my bank’s bog stock, bare bone home banking platform (they have deluxe versions available, but like Hell I am going to pay for them) allows retail investors to buy Ukrainian and Venezuelan government bonds. If that’s not pure financial toxic waste, I don’t know what is. One of the main mysteries about these junk bonds is how damn low yields on Venezuelan bonds are. If Ukraine has an implicit guarantee from the EU and US taxpayer, Venezuela has no such luxury. Every bailout has to be laboriously negotiated with foreign “benefactors”, meaning China, which is increasingly getting tired of being promised oil in payment, oil that never gets delivered by cash-strapped PDVSA. Who, even in our crazed ZIRP/NIRP world, would lend money for ten years to Venezuela at 11.5% interest? Especially when there are so much better deals out there if you feel adventurous: Peruvian 10 year yield a full 6%, Chilean 4.5% and Indian 7.4%. If you want to show your support to Iceland for jailing bankers (but not hanging politicians), their 10Y presently yield a not too shabby 6.2%. Wow you’ve shocked me with that Venezuelan quote. Surely there can’t be any buyers at that paltry rate. India looks positively golden by comparison. India’s interest rate is so high because interest rates there are insanely high by Western standards: the Reserve Bank of India charges member banks 6.5% for the privilege. Truth to be told it’s nothing strange as BRICS all have interest rates we would kill for: Brazil is 14.25%, Russia 10.5%, China (official) 4.35% and South Africa 7%. So far no BRICS central bank has embarked on a QE program, chiefly because by Western standards their sovereign debts are ridiculously small and hence there wouldn’t be much to buy anyway. Yes, China does what it does, but it’s really not a Fed-style QE, more like continous direct stimulus. Regarding Venezuela. A little intriguing piece of news: the last official data we have about their public debt are from 2013. Ancient history by modern standards and they were nothing to write home about: despite the quick recovery in oil prices it went from 26.3% of GDP in 2008 to 49.8% in 2013. As usual, all government data should be handled with caution and Venezuela, with extremely unreliable data regarding everything from oil production to CPI, is no exception. Little is known that Venezuela has been selling off the family jewels for at least a couple years now: under the Petrocaribe scheme, countries from Central America, like Jamaica or the Domican Republic, paid for the oil they got from Venezuela through fixed yield obligations. Major Wall Street firms (headed by Goldman Sachs) have been buying these obligations from Caracas hand over fist: in a NIRP and ZIRP world those obligations yielding 4-8% are a Godsend. It’s deeply ironic what’s left of Chhavismo is being financed by dollars obtained by firms associated with the worst excesses of Capitalism. At last count Venezuela had an estimated $3.5 billion in Petrocaribe obligations left… if the rebound in oil prices, as it seems is over as it should they won’t last much longer. I assume these yields are on their foreign-currency bonds. Because a bond issued a year ago in bolivares is nearly worthless today. So Venezuela cannot issue bonds in bolivares. No one is buying. India issues bonds in its own currency, but it has a fairly high rate of inflation (by EU, US, Japanese standards). So the expected rate of inflation gets baked into the yield. Indian inflation is not an issue in their foreign currency bonds. And you’re right to be amazed at how low some of these yields on foreign currency bonds have been. Last year, Mexico sold 100-year dollar bonds at a yield of 4%. But bondholders have the assumption that they’re going to get bailed out by the IMF and an “international consortium” – as happened during the Tequila Crisis – with Mexican taxpayers paying for the whole package over many years. ‘I would rather have the return of my money, than a return on my money’. This is a capital movement to safety, as can be seen by the recent strength of gold and the spectacular spike up in silver. Which is bad news for the bullion banks that are caught on the short side, with their record high open interest on the COMEX. The financial tide is beginning to recede at an ever increasing pace. Soon to expose those who have been swimming naked! Despite the CME raising margin requirements twice in as many weeks, along with some big brokerage houses. What we need now are the 5 Chinese Brothers. And their Mother. Because after the tide goes Waaaaaay Out, we get a tsunami. A good children’s book about this is “Salt is Better Than Gold”…I have it propped up next to “The Black Swan” (sf book) and my Black Swan wine bottle and I have an antimacassar that has black tulips embroidered on it. And, ok, I admit the display also has a Columbia Silver-plated Teapot, because even during the Opium Wars, the Junks went up and down the Yangtze carrying on trade. Gallows humour. Can the very richest ones get control of the slightly-less very richest and decide to go for the (gold) silver? It might work, but I can’t see governments giving up their power to inflate. And I can’t see most people working as hard for as little as used to be the case for most of history. This is the “moral hazard” for the not-rich…we spend our labor stupidly because of the full punchbowl. The opium trade depended on sailing ships and saw the fastest ones ever, 200 miles + a day with good winds. The wealthy Chinese family before the revolution would have opium in the house the same way a wealthy English family would have whiskey. You could offer a guest a pipe, but only three. Opium tore through the Chinese lower classes, but bathtub gin did much the same in England. The world’s pre-eminent travel writer, and considerable historian Paul Theroux admits to sampling opium- resulting in pleasant dreams of flying. Morphine, an opium derivative was first marketed as a cure for opium addiction. Heroin, an opium derivative (Bayer trade name) was marketed for its ‘heroic’ ability to cure morphine addiction. So maybe we should legalize opium, the original natural opiate. God- just looked again at the WS topic- I digressed. Silver: parabolic rise & short term over-bought. Doomed. Doesn’t history prove if it’s rated AAA that’s a sign of trouble? Unless of course you believe analysts are honest and aren’t actually swindlers and coke heads. When Micheal Milken invented the junk bond market he knew that the majority of bonds would be paid off. He knew the rate of default was much lower than indicated by the bond ratings. He was making good bets. That is no longer the case. The rate of default is now high and the bond ratings are worthless. This is not the same junk bond market of yesteryear. It wasn’t a honeymoon Wolf, it was a one night stand. That the market is shaky is hardly news, and for just that reason, everyone is operating with a hair trigger. At the first sign of difficulty, the scared money cuts and runs. That is exactly the problem, it is only a matter of time before one of these panics turns into something too big even for the lulus on the the Presidents Working Committee to backstop. Once the derivatives market starts to unwind, the game is over. There isn’t that much money in existence. And forget about “notional value”, the holders will demand 100 cents on the dollar.